Verizon Media’s Yahoo brands are investing in more live events and activations to engage directly with its audiences. Yahoo Sports is producing a number of activations for football fans to gear up for the Super Bowl on Sunday in Atlanta, while Yahoo Finance has announced the global expansion of its annual All Markets Summit. 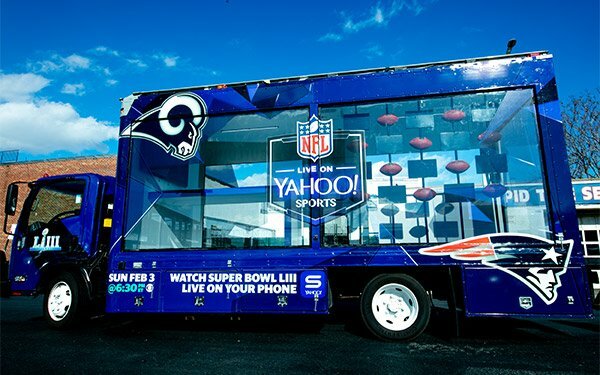 Yahoo Sports will have a pop-up truck installation called the “Fan Cave” making stops at popular locations around Atlanta, where fans can play trivia and games to win prizes. The Fan Cave will also remind people to watch the Super Bowl live on the Yahoo Sports app, via its NFL Live video stream, come Sunday. The truck will makes its final stop outside the Super Bowl Plaza in Mercedes Benz Stadium, where it will serve as the backdrop for Yahoo Sports’ live game-day coverage. In addition to the Fan Cave, Yahoo Sports will have additional content supporting game coverage, such as a live taping of “Mostly Football” today, with host and Super Bowl champion Martellus Bennett at the main stage on Radio Row. Guests on the show will include Von Miller, outside linebacker for the Denver Broncos and Malcolm Jenkins, safety for the Philadelphia Eagles, among others. A live pre-game show will feature Michelle Gringas from “The Spin,” Jacksonville Jaguars defense end Calais Campbell and Yahoo Sports NFL writers Kimberley Martin, Terez Paylor, and Charles Robinson providing fans with live coverage and analysis throughout the day. Amanda Borges and former NFL defensive back Tank Williams will also provide in-depth analysis and key breakdowns. In other Yahoo-related news, Yahoo Finance is expanding its All Markets Summit internationally. The conferences this year will take place in New York City on September 9; Sydney, Australia on September 26; and London on October 3. The events will be live-streamed on the Yahoo Finance website and app, on Apple TV and Roku, as well as other channels. The All Markets Summit brings together leaders in business, media, government and philanthropy to discuss the economic challenges facing the world. The 2018 events reached 40.5 million viewers. A spokesperson told Publishers Daily the franchise events "further diversity our revenue streams and provide an opportunity to offer global sponsorships for our advertisers." The All Markets Summit launched in 2017 and was previously held solely in the U.S. It is Yahoo Finance’s first conference franchise. Verizon Media has another upcoming live experience for its audience: its annual “Makers Conference,” a global women's leadership event, will kick off Feb. 6-8 featuring trailblazing women from activist Gloria Steinem to HuffPost editor-in-chief Lydia Polgreen.